All students at Elm Park School have their own e-Portfolio blog. Links to your child’s e-Portfolio blog can be found on this page. 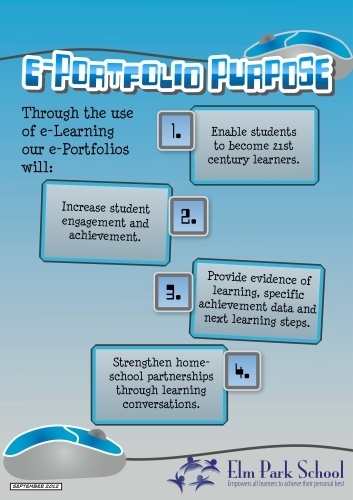 Our e-Portfolio blogs, with examples of your child’s learning, are open to the public for anyone to view. Parents and caregivers are encouraged to leave positive comments about their child’s learning in the e-Portfolio blogs. However, only parents and their children have access to the reporting part of the e-Portfolio blog as this contains confidential achievement information. In addition to e-Portfolio blogs and reports, we also host Parent Information Evenings, 3 Way Learning Conferences and Student-Led Conferences to keep parents informed about their child’s progress. Please contact Sara Melville if you have any questions. A Student Led Conference is a conversation about learning between a child and his/her parents or caregivers – led by the child. Conferences are held in the classroom for 30 minutes each. The teacher will be present to support and prompt as necessary but will not participate. Students will have a checklist of learning areas to discuss with their parents/caregivers. Students will have practised presenting their information to peers and teachers several times before the conference. Parents/caregivers may ask questions to encourage the learning conversation. There will be several families in the classroom for SLCs at the same time. Hello there, here's the latest news from Elm Part School: "Reporting to Parents". Here is the website link: https://www.elmpark.school.nz/reporting-to-parents/. Thank you!